Papers about strategies and technologies are all over the desk. You can barely see the wooden table, which has been used by different generals over decades. For days we have been trying to figure out which is the best strategy to shoot down our enemies. We can’t afford to lose any more men and it is time to win this war. We rummage through old logs and diaries. On second glance on all the different papers with strategies we discover an empty page with the title ‘the Hexagon Strategy’. I think it is time we fill this blank page with letters and write history with this new game plan. The provinces have hex field shapes. It is a point-symmetrical map with one main island and several small islands. It is made for 5vs5, 5 players on each side of the island. Perfectly suited for alliance games. 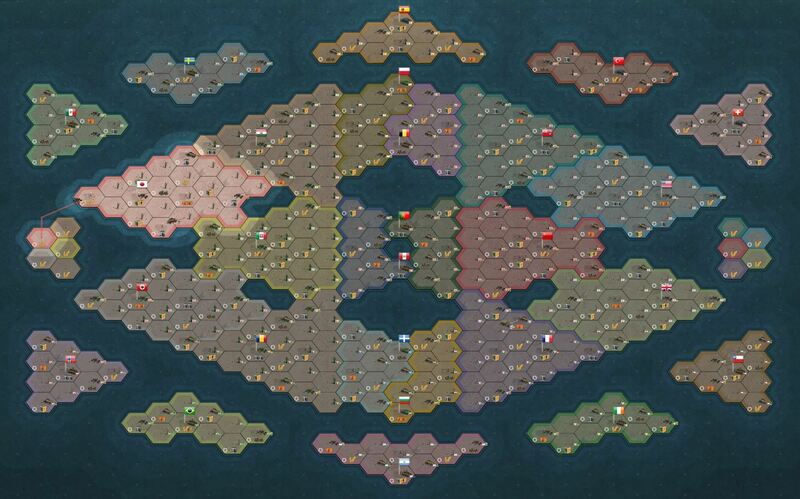 Every player starts with 22 provinces. Everything is perfectly balanced for both teams. Multiple AI countries can be conquered for an additional advantage. The terrain is designed to create multiple fighting hotspots with different possible strategies. The resource distribution & player positions within a team are designed in a way to encourage different roles and focuses (like land offensive or air & naval support). The research cost and times are reduced by 50%. To achieve the best game experience on this new strategical map we recommend to create maps with enabled peace period and starts when full settings. The map is a Gold Feature. This means, to enter the map you will have to pay 5.000 Gold or be part of the High Command. Join other Gold rounds, such as anonymous rounds and maps with Elite AI. Set rally points to make it easier for your units to get in position. Queue your buildings, think ahead. Your units will be able to listen to advanced fire control commands. Share the the information you gathered with your allies. Upload pictures in the newspaper to give your article the ultimate visualization. In regards to the new map it will now also be possible to fill team games in an asymmetrical fashion. The timer on production did not work properly yet, we fixed that. We hope our generals like the update, please let us know in the forums. We wish you all a lot of fun figuring out new strategies on the new map and feel free to share them with us . While it is annoying that it is a gold feature, it is also (apparently) accessible with HC. The reason why is something that is free is not treated with respect. If someone has to put value on the table to play, I believe they will be more likely to play to completion and not just abandon the game willy nilly. A significant portion of games I have been in have been dramatically changed by a player abandoning play. Perhaps the small fee will be a good "gate keeper" and ensure only serious players are on the map. I will be looking for one of these games when my RL schedule allows it again. Gold feature has its pros and cons. I am going to try this out. Any chance someone can post a screen shot of the map. Just trying to visualize it from the description and my head hurts. Per me la nuova mappa è diciamo utile per fare esperienza ma come aspetto estetico fa veramente schifo . A me non piace mi sembra come se hanno preso degli schizzi di arte moderna e li abbiano riflessi come a formare un' immagine unica. So CoW is becoming one of those pay to play games? The post was edited 1 time, last by nemuritor98 ( Feb 8th 2017, 9:23pm ). Good. Take your hyperbole into the future. yes, but sadly this isn't working as expected yet. But it will be available for all maps.